Francisco Martinez was a renowned Physician and medical Professor in Ecuador but in mid-life he also became a statesman and a close collaborator of President Eloy Alfaro. 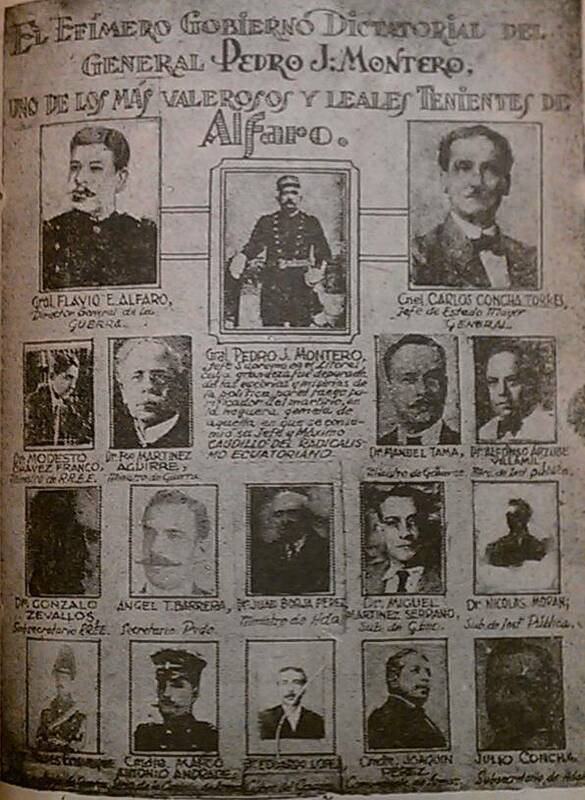 In the two critical years before the murder of Eloy Alfaro, 1910 and 1911, he was one of the five ministers in the Cabinet of Eloy Alfaro holding the position of Minister of Defense1. Throughout his life he held several high-level political positions in the government of Ecuador and high-level academic positions in the medical schools of Ecuadorian Universities. He was born in a small town (Baba) in Ecuador in 1850 and by 1864 had obtained a BA in Philosophy in Guayaqil. 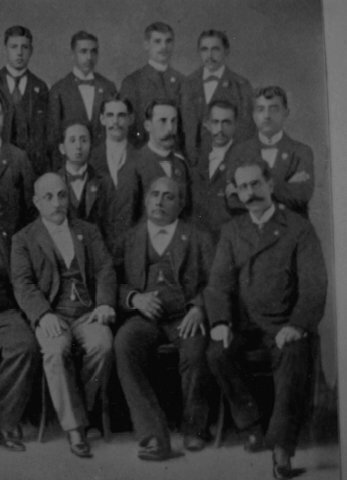 He traveled to Europe and attended Medical school in the U.S. and in the spring of 1871, the 21 year-old Francisco was awarded a Medical Degree from the University of Pennsylvania. According to Ecuadorian Biographies, he held Medical positions for a few years2 in Philadelphia but his marriage to his first wife, Rafaela Serrano y Ruiz occurred two years after his graduation on October 13, 1873 in Quito. At that time Garcia Moreno was President of Ecuador3. Under President Moreno, enormous political power had been given to the Catholic Church in Ecuador and freedom of conscience had been suppressed – going even so far as to deny the right of Ecuadorian Citizenship to non-Catholics. According to a biography that appeared in the Ecuadorian newspaper “El Telegrafo” on January 6, 1951 marking the 100-year anniversary of Dr. Martinez’ birth, he functioned as a professor of the Medical School of Central University of Ecuador from 1878 until 1910. This medical school was new at that time having been founded in 1877. Located in Quito, Central University is the oldest university in Ecuador, and one of the oldest in America. The enrollment today is over 10,000 students. It was formed in 1769 from the unification of two private Catholic universities, one Jesuit (founded in 1622) and one Dominican (founded in 1688). In 1897 Dr. Martinez was appointed assistant Dean of the Medical School and a year later he was appointed Dean. Dr. Martinez is noted for having been the first in Ecuador to use the autoclave to sterilize medical instruments at a time when the existence of microbes as disease-causing pathogens was still not accepted in Ecuador. He is also credited with using cadavers for the first time in Guayaquil -introducing preservation methods especially necessary in the warm Guayaquil climate- for education of medical students. He is noted for having produced many oil paintings illustrating anatomical or medical procedures for use as educational visual aids. According to the above mentioned article, Dr Martinez described himself as “…of liberal principles and convictions, without ties that bind to any faction”. In the language of those times, “liberal” was a label used for those who advocated decreased political power for the Catholic Church in Ecuador and amelioration in the plight of the economically disadvantaged classes in Ecuador. These two issues were closely related. It was early in the presidency President Caamaño that Dr. Martinez’ publication “El Perico ” first appeared and all sources affirm that Dr. Martinez was Exiled to Peru as a result of his role as publisher/editor of this newspaper. Publication of El Perico was also shut down by the government at this time. This was in February 1886 -over twelve years after his marriage to his first wife …they had six small children by this time. … Exiled to Peru for his progressive ideas, he settled in the city of Trujillo, where he published a newspaper in opposition to the government of President Don José M. Plácido Caamaño. Historian Jose Antonio Gomez Iturralde states that Dr. Martinez “was taken prisoner and sent into exile…” at this time5. 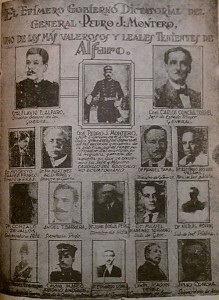 Of course the above-mentioned campaign was one of many revolutionary campaigns led by Eloy Alfaro against the pro-Catholic “conservatives” over the years but while preparing for this one he came into close contact with Dr. Martinez in the midst of the Ecuadorian exiles – who by this time had developed a reputation as the “combat author” and editor/publisher of the influential publication El Perico. R. Perez Pimentel also mentions that while an exile in Peru, Dr. Martinez was able -thanks to the assistance of a physician friend Celso Bambaren6– to establish his professional Medical credentials at the Medical Faculty of the University of San Marcos, thereby enabling him to continue to function as a physician during the period of his exile in Peru. Two and one-half years after his graduation from the University of Pennsylvania, Dr. Martinez had married his first wife, Rafaela Serrano y Ruiz on October 13, 18737 and they had 9 children. But she died at a relatively early age in 1892. A few years after the death of Rafaela, Dr. Martinez married Maria Teresa Del Pozo Santos, On Saturday November 28th 1896. The bride was 22 years of age and the groom was 46 years of age. They had five children, though there were others who did not survive (twelve total according to oldest son Ramon). She was a niece of the Bishop of Guyaquil . This is especially significant in view of the fact that Dr. Martinez was very active in the movement in Ecuador to deprive the Church of the vast power it enjoyed in those times. Dr Martinez’ marriage to this second wife Maria Teresa on Nov. 28th 1896 occurred shortly after Eloy Alfaro’s assumption of the presidency and it was at this time that Dr. Martinez started to hold actual positions in the government of Ecuador. She was his wife at the time of the Murder of Eloy Alfaro and must surely have felt it as a great threat to her personal security as it meant imminent danger to the life of her husband and she had three very small children at that time. This was truly a time of great trauma for the family. Eloy Alfaro was not just “the president”, the family interacted socially with him. Two other traumas would strike the family in the days leading up to Alfaro’s murder: the death of their own eight-year-old daughter “Maria Teresa” (named after her mother) and the dreadful death of General Montero, another important figure in the “Alfarista” movement. Dr. Martinez had risked his life to support Montero at a highly critical juncture in Ecuador’s history. Dr. Martinez was Senator from Los Rios Province in 1901, 1902 and 1903 and Minister of the Interior in 1907. Dr. Martinez was elected Governor of the Ecuadorian Province of Guayas in 1907 and 1908 (Ecuador’s port and largest City Guayaquil is located in Guayas). Dr. Martinez was appointed “Minister of Public Instruction” in the Eloy Alfaro Government in the years 1906, 1907, 1908 and 1909. This was a very important position as the Alfaro Government was in the process of secularizing the Education System in Ecuador, ending the church’s stranglehold over education in the country. He was uniquely qualified for this position in view of the fact that he was one of the most educated men in the country and had been the editor of the most popular newspaper in Guayaquil (“El Perico”) which had been instrumental in effecting significant change in Ecuador. In 1898 and 1907 he served as Dean of the Faculty of Medicine of the University of Guayaquil. When Alfaro’s first term came to a close in 1901, a new president -Leonidas Plaza- was elected. Plaza was also an active member of Ecuador’s “liberal” party but during his presidency he distanced himself from Alfaro, bringing a large faction of the “liberal” party with him. Plaza’s strain of liberalism agreed with Alfaro’s on the subject of separation of Church and State but Plaza did not share Alfaro’s determination to liberate Ecuador’s working poor and Indians from the wretched state of economic servitude under which they toiled. On the contrary, he allied himself with the large landowners to consolidate his power. Dr. Martinez was loyal to Alfaro during this time; he did not serve in Plaza’s government. By the time of Alfaro’s second term in 1906-1911 he was considerably weakened due to this liberal split and was ultimately forced by the army to abdicate just a few weeks before the end of his term. His successor was a sickly man, Emilio Estrada who died three months after assuming the presidency, leaving a very dangerous power vacuum in Ecuador at the end of 1911. Dr Francisco Martinez supported General Montero and accepted the cabinet position of Minister of War in Montero’s short-lived provisional government. His son Miguel also accepted a role in Montero’s provisional government and the telegram recalling Alfaro from Panama was sent by Miguel. Meanwhile back in Quito, temporary President Freile Zaldumbide placed Plaza in command of the army sending him down to Guayaquil to quell the rebellion led by Montero. Plaza was now wearing the dual hats of political candidate for an upcoming presidential election while simultaneously head of the Army militarily challenging the political opposition. Contemporary graphic showing ‘the Ephemeral dictatorial government of General Pedro J. Montero, one of the most courageous and loyal adherents of Alfaro”. Photos of Dr. Martinez (Minister of War) and his son Dr. Miguel Martinez Serrano also appear. All in the space of three short weeks in January 1912, the contending forces led by Plaza and Montero fought three separate battles, all won by the government forces. The third of these battles -the battle of Yagauchi- has been characterized by Ayala as “one of the the bloodiest battles in Ecuador’s history” and Spindler assures us that “about fifteen hundred contenders fell upon that battlefield”. Three reliable historical sources tell us that upon hearing the outcome of this battle, Dr. Martinez immediately abandoned his post as Minister of War and went into exile (to Chile8). The country was now truly on the verge of anarchy; in the midst of “el mes tragico” (the “tragic month”). The date for this event (ie: Dr. Martinez’ exile) is on or about January 20th, 1912. Genealogical Records from the City of Guayaquil tell us that the death of Dr. Martinez’ nine-year-old daughter, Maria Teresa, occurred a day or two later on January 21. It is possible that these two events -the death of his young daughter and his flight into exile to Chile- are related in some way but this question is still being researched. Within the next week, Montero and Alfaro -together with about seven of his closest collaborators- would be put to death in the most horrific circumstances. It is difficult to determine which members of Dr. Martinez’ family came with him into exile after the murder of Eloy Alfaro (if any) and which ones stayed behind in Ecuador or for how long. We do know that they had three very young children at the time 9 (aged 2yrs, 3yrs and 5yrs) and that his wife Maria Teresa gave birth to her youngest son Bonifacio in Ecuador in early March of 1913, 13 months after his initial departure. Whether she joined him later is still unclear. However when he returned, it was on the occasion of a Medical Conference in Guayaquil in 1915, according the El Telegrafo Biography. “…The Colonel Dr. Francisco Martinez Aguirre, upon learning of the disaster of Yaguachi, secured passage out of the country abandoning thereby his charge as minister of the War and Navy”. Although we can marvel at the courage and heroism of Eloy Alfaro, Pedro Montero, Luciano Coral and the others, it is fully understandable that many of the leading men would abandon the field at this point rather than surrender their fate to the basest instincts of the savage, barbaric elements that were unleashed in Ecuador in late January of 1912. Little is currently known of Dr. Martinez’ years in exile in Chile from 1912 to 1915. He was the father of several young children at the time of his departure and the entire ordeal must have been a harrowing experience for his wife. All we know for sure is that he shows up passing through Ellis Island in June 10th 1913 and that his youngest Son Bonifacio was born in Ecuador in March 1913. In 1917, two years after his return to Ecuador from his exile in Chile, the 67 year-old Dr. Martinez suddenly came down with a mysterious illness and declined rapidly. By the time it was diagnosed (blood poisoning) it was too late to save him and within days he was on his death bed. He died February 8th 1917. He was survived by the twelve children from his first marriage, his second wife Maria Teresa and the five children through her. The children from his first marriage stayed in Ecuador but within a relatively short time after burying her husband it appears that Maria Teresa was already making preparations to emigrate with her family to New York. She would arrive there (Ellis Island) in 1919 – two years after her husband’s death- and the four children with her on the ship were ages 6,9, 10 and 11 (Bonnie, Mary Agnes, Sookie and Lola). Maria Teresa’s untimely death from cancer of the Uterus would leave these young children orphans within a year after the family’s arrival in New York. Maria Teresa and Francisco’s eldest son Ramon -who was about 20yrs old at the time- had recently arrived in New York and was working for the pharmaceutical firm W.R. Grace & Co. Formerly in Ecuador he had worked for this company translating pharmaceutical labels from English to Spanish. After her untimely death in New York, her four orphaned young children were looked after by their older brother Ramon and sent by him to be “raised by nuns” (as they would later express it) in a Catholic boarding school. It is perhaps significant to note that after Maria Teresa’s death, in compliance with her wishes, her body was clothed in the habit of a Dominican nun and interred that way. On the occasion of the one-hundred-year anniversary of Dr. Martinez’ birth, a biography of Dr. Martinez was published in El Telegrafo, one of the largest newspapers in Guayaquil – in 1951. In the 1980’s, the wife of Dr. Martinez’ youngest son found this article and an English Translation is available here on this site (click – pdf) 10.